This week’s theme includes a lot of patriotism, with decorations, clothing, dinnerware, picnic gear, and more to celebrate Independence Day. This week also features pool and water accessories, camping equipment, and kids’ toys. Intex Inflatibull, $39.99. This measures 7′ 10″ x 6′ 5″ x 2′ 8″, and it’s a giant ride-on inflatable bull suspended inside a large inflatable ring. It’s so different that, of course, it caught our eye. 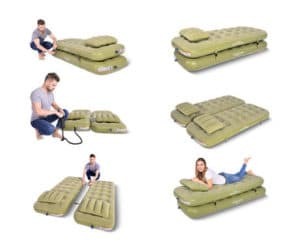 Adventuridge 4-in-1 Airbed, $19.99. Functions as a single bed, a double-high single bed, 2 single beds, or a double bed. We’ve reviewed one of Aldi’s other airbeds here. Adventuridge Sleeping Bag, $12.99. Green or blue. We’ve got some general thoughts here. Adventuridge 4-Person 9′ L x 7′ W Dome Tent, $19.99. Green or blue. You can read our review of the tent here and see our experience with the warranty process here. Adventuridge Lighted Tent Fan With Remote Control, $12.99. You can see some of our general thoughts here. Adventuridge Collapsible Tub or Bucket, $7.99. Blue or green. We’ve used a similar version to this one and like it. You can read some other general thoughts here. Adventuridge Butane Stove, $14.99. We’ve got some general thoughts (including where to get butane canisters) here. Adventuridge Portable Hammock With Stand, $39.99. Blue or green. We haven’t tried this one out, but we have tested the travel hammock, which we’ve written about here. Adventuridge 24-oz. Stainless Steel Vacuum Bottle, $6.99. Various colors. Claims to be good for up to 12 hours hot or 6 hours cold. Adventuridge 15-in-1 Multitool, $5.99. Various colors. Includes carry sheath. A variety of tools, including knife, can opener, pliers, and nail file. Adventuridge Small Cooler Bag, $9.99. Assorted colors. Dimensions: 12.2″ x 5.2″ x 11.8″. Adventuridge Extendable Fork, Fly Swatter or S’mores Maker, $2.49. Gardenline Folding Web Chair, $9.99. Adventuridge Soft Sided Basket Cooler, $9.99. Seasonal Designs American Flag Set, $6.99. This measures 3′ L x 5′ W.
Huntington Home 4th of July Decorative Wood Curl Wreath, $18.99. This comes in assorted colors and measures 18″ in diameter. Men’s or Ladies’ Americana Shirt, $4.99. Sizes M-XXL. Children’s Licensed Americana Sets, $7.99. Assorted colors in sizes 2T, 3T, 4T, S, M.
Huntington Home Patriotic Banner or Bunting Assortment, $2.99. Grafix 4th of July Glow Assortment, $1.99. Sundae Shoppe Red, White & Blue Pops, $1.89 for 21 oz. Village Bakery Patriotic Frosted Sugar Cookies, $2.89 for 13.5 oz. Crane Bodyboard, $6.99. Measures 18″ x 33″ x 2″. Fluid Life Vest, $8.99. Assorted colors in sizes Child, Youth, or Adult. Read our thoughts on last year’s Fluid life vest here. Crane Snorkel Set, $12.99. Includes 2 flippers, 1 mask, and 1 breathing tube. Intex River Run I Inflatable Tube, $14.99. Banzai Water Sprinkler Assortment, $7.99. Assorted varieties. Crane Extra Large Beach Bag, $6.99. Measures 21.26″ x 18.11″ x 6.3″. Available in assorted styles and colors. Jilong Soccer Bumper Ball, $29.99. Banzai Inflatable Battle Assortment, $9.99. American Plastic Toys My Very Own Grill or Ice Cream Cart, $16.99. Crane 2-in-1 Lawn Darts / Bocce Set, $9.99. Easy Home Tower Fan, $19.99. Approximate height is 29.9″. Huntington Home Summer Coir Mat, $6.99. Measures 18″ W x 30″ L.
Lily & Dan Girls’ Jelly Sandals, $3.99. Sizes 5/6-2/3. Crane Men’s or Ladies’ Memory Foam Sandals, $8.99. Assorted colors in Men’s 9-12 and Ladies’ 7-10. Crane Boys’ Slide Sandals, $6.99. Sizes 9/10-4/5. USDA Choice Twin Pack Boneless Beef Ribeye Steaks, $5.99 per lb. Orange Ginger Cedar Plank Salmon Side, $9.99 per lb. Cedar plank included. Certified Best Aquaculture Practices. Butterflied Lamb Leg, $5.99. Choose from rosemary or unseasoned. Adventuridge, American Plastic Toys, Banzai, Boulder, Crane, CreativeWorks, Easy Home, Fluid, Gardenline, Grafix, Huntington Home, Intex, Jilong, Lily & Dan, Seasonal Designs, Starplast, Sundae Shoppe, Village Bakery. Bookmark.